On any given Saturday, one DeKalb County School District (DCSD) freshman can be found preparing large quantities of hot dogs, meatballs, baked beans, potato salad and more as early as 9 a.m. By about 2 p.m., she can be found serving such foods to men, women and children in need in her community. 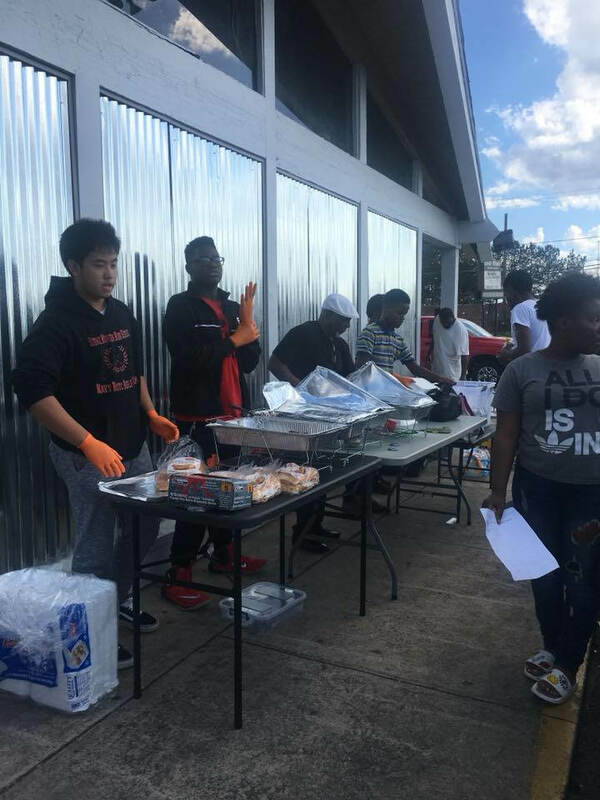 Stone Mountain High School freshman Sevon Burns is the head of Sandwiches With Sevon, a nonprofit effort focused on feeding the less fortunate in DeKalb County. Since 2016, Sandwiches With Sevon has served more than 3,500 free plates in the community and shown no signs of slowing down. According to Burns, serving the community began when she was just a small child. Her mother always participated in back-to-school drives and similar charitable efforts. When she turned 14, Burns decided to reignite such efforts and inspire her community to give back. The nonprofit began when Burns noticed lots of foot traffic near Chit Chat Restaurant & Lounge, which transforms into Sandwiches With Sevon’s headquarters every Saturday afternoon. Burns said many people don’t realize that homeless or hungry people have simply fallen on hard times and need any help they can get. For Sevon, helping begins every Friday evening with a trip to the local grocery store. There, she spends money collected through donations on food items that will be cooked the following morning. Burns will sometimes wake up as early as 8 a.m. to begin preparing food by 9 a.m. By as early as Noon or 1 p.m., she and her father, Anthony Burns, are on their way to Chit Chat Restaurant & Lounge. By 2 p.m., a line of people awaits Burns and those who join her to help. Burns said being depended upon gives her a sense of pressure, but that she also welcomes it. “I always put pressure on myself. I’d rather be part of the solution than the problem,” she said. In the not-too-distant future, Burns plans to rent or purchase a building where people can stay if they have nowhere else to go. She hopes to set up an area with computers to help individuals with a wide array of activities, including homework, obtaining a state ID card, and completing online job applications. She also hopes to help tutor students for free. According to her father, efforts to make these plans become a reality are already in motion. Despite all this activity, in addition to joining Stone Mountain High’s Junior Navy Junior Reserve Officer Training Corps (NJROTC), Burns grades remain immaculate. If her grades do start to slip because of Sandwiches With Sevon, she knows she will have to miss a week of preparing and serving food. Anthony Burns is a veteran of the United States Army. He said he’s happy to see the discipline, selflessness and character have a positive influence on Sevon. Sevon Burns said she gravitated toward NJROTC because of its high regard for teamwork and selflessness. Burns’ lead NJROTC instructor, Haamid Malik, said it’s inspiring to see a cadet take initiative in the community. 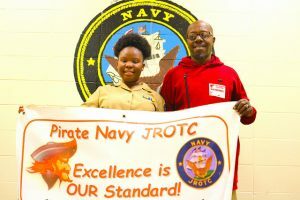 Stone Mountain High’s NJROTC commander, John-Michael Jones, said it’s a pleasure to have Burns as part of the school’s program. “A lot of people look at NJROTC as a program that fixes kids, and in some cases we do. But we’re also an organization that attracts kids who already at a high level. That’s where [Burns] is,” Jones said. When she finishes her time at DCSD, Burns hopes to become a marine biologist or veterinarian. Her love for animals and proclivity toward helping people has set her sights on Savannah State University. Until then, Burns said she will continue the work that needs to be done in her community. She said she will also be seeking out those who can carry on Sandwiches With Sevon when she moves on to the next phase of her life. To join Burns’s fight in helping the DeKalb County community, visit www.facebook.com/SandwichesWithSevon.